Contributing writer Jodie Ashdown popped along to the Snapped Up Market at the Printhaus to have a go at some activities. Here’s what she got up to! Sitting just off the main street, nestled in between closed hairdressers and Sunday drinkers is a special little place. A place that throws open its doors to the public so that they can print, shop, sew, hammer and drink craft beer to their heart’s content. And this place is called the Snapped-Up Market. 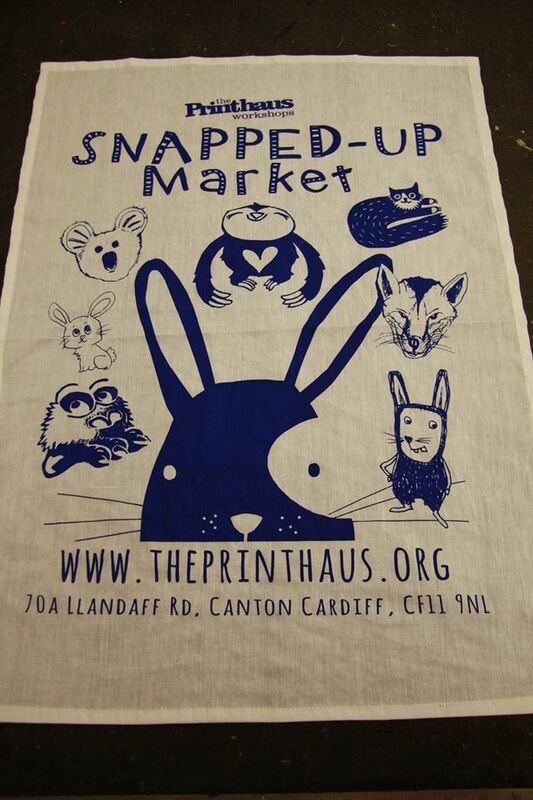 Occurring quarterly, the Snapped-Up Market is a hands-on experience with activities suitable for adults and children and an overarching theme unique to that particular market. 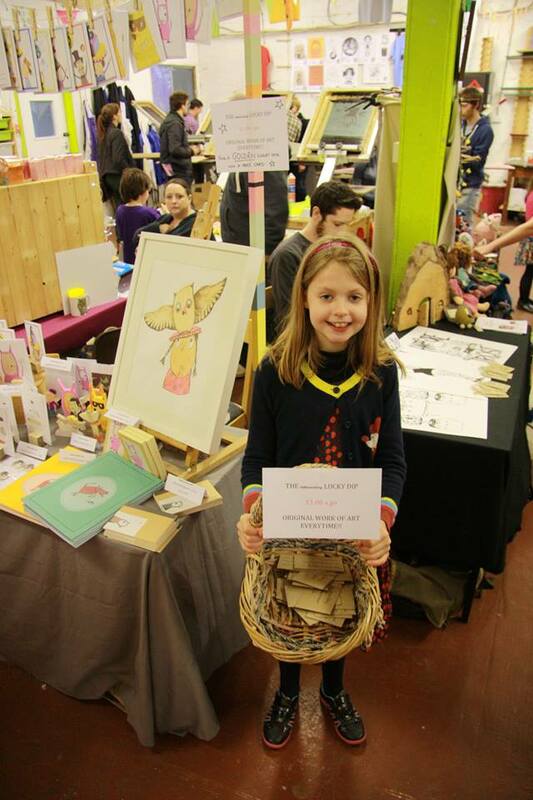 This time the market, which took place on the 6 April 2014, was focused around the theme ‘Furry Little Creatures’. Previous themes have included ‘Heroes & Comix’ and ‘Circus’. 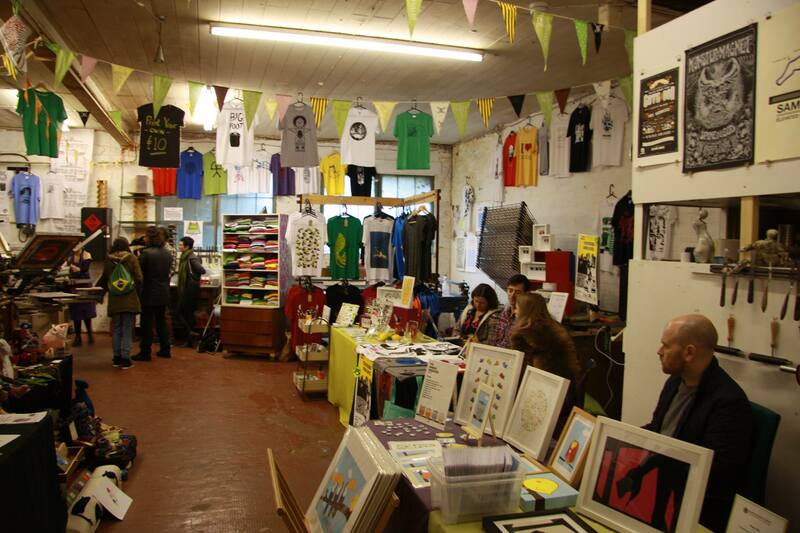 Taking place in the Printhaus workshop on Llandaff Road, the market is a chance for local artists, artisans and generally artistic people to come along and show their wares, as well as giving us less-creative folk the chance to try our hand at making something awesome. We are Cardiff headed down on the day to try out a few of the crafts and sample one, maybe two, of the beers. The atmosphere is immediately uplifting, even in the dreary rainfall of a cloudy April Sunday. Everyone is friendly and relaxed, not just the stallholders and artists but also the customers who meander, coffee in hand, through the workshop under crisscrossed bunting surrounded by original art. 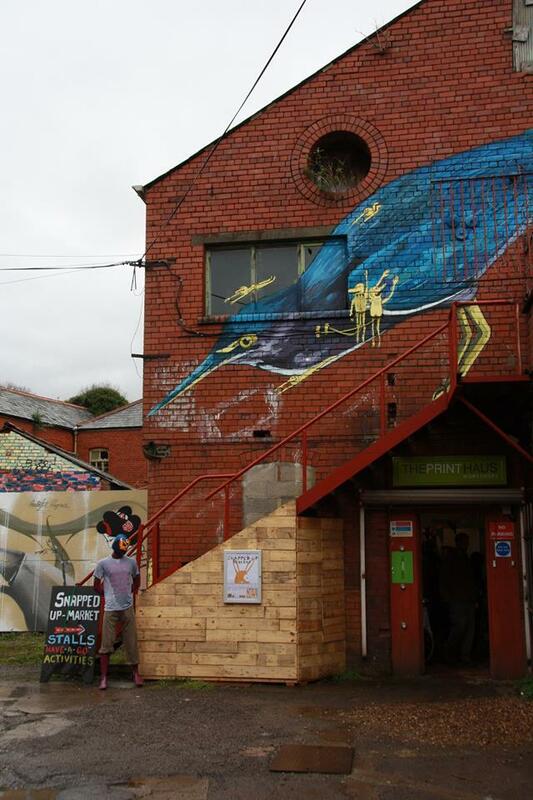 The graffiti artwork adorning the outer walls is an accurate indication of the creative hub inside. We decided to have a go at a few of the activities on offer. First up was Alys from www.thepocketpirate.com. 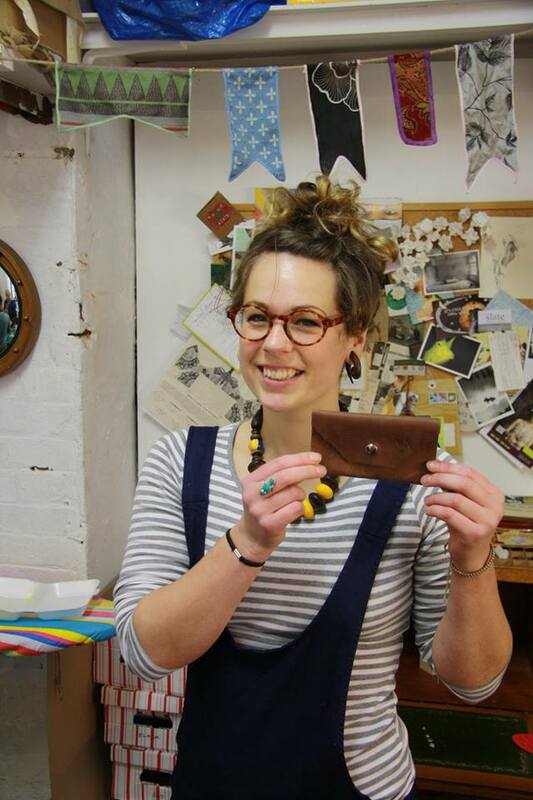 Aside from selling, among other things, handmade cushions, fabric purses and bags, Alys provides you with the opportunity to make a leather purse. The procedure is pretty simple: you choose your leather, cut, mark, stick, sew, chat and then you’re done. A simple but effective project, all for £7. 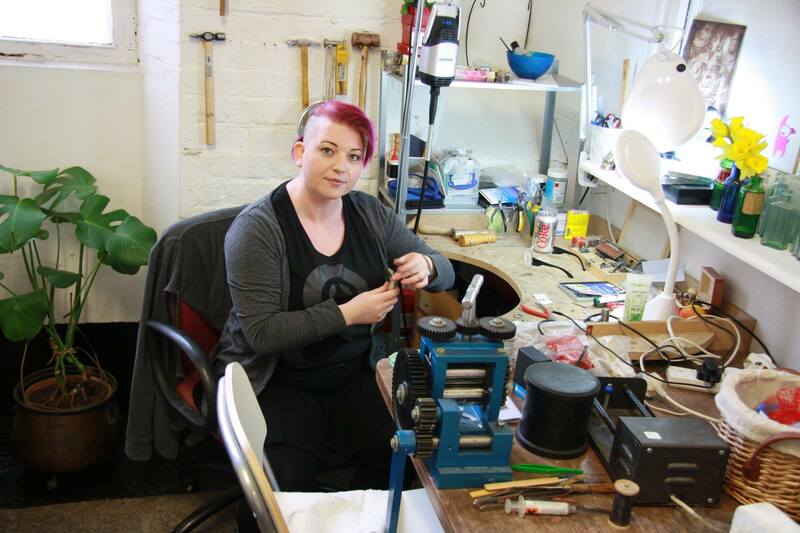 Next was Lydia who will guide you through making your own silver ring. It’s a satisfying process involving a hammer, acid and a blow torch. For obvious reasons, you have to be over 16 years old but it’s a pretty unique way of hammering out your frustrations and turning them into something beautiful. Lydia also has an array of silver jewellery on sale at the market and also does bespoke designs. Here’s her website: www.niziblian.com. The printing part of the market came next. 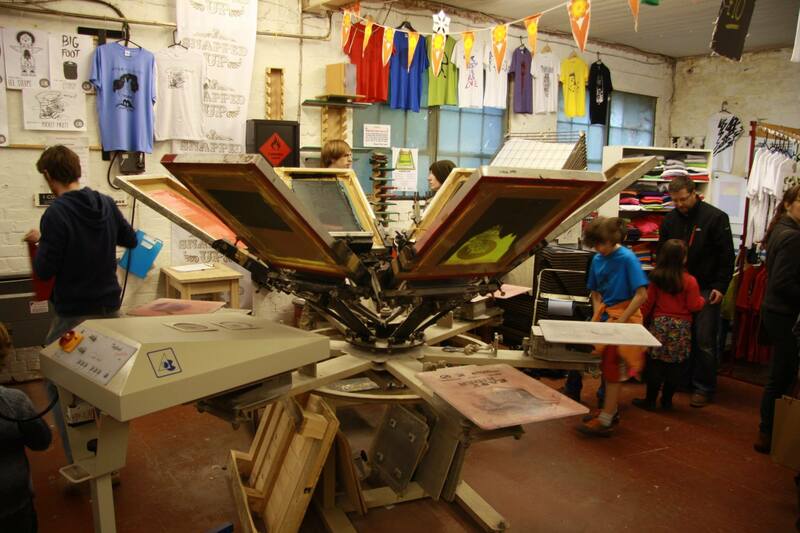 The Printhaus ( www.theprinthaus.org ) have a good stock of printing equipment which the team (Nigel, Tom, Jude and Rob) bought after some pretty solid fundraising, which can be used to put designs on all manner of things including t-shirts, tote bags and tea towels. They run courses on site and there’s an option to become a member, meaning that after training and induction you can use the facilities whenever you want for a small fee. They’re a not-for-profit organisation who want to help bridge the gap between school or college to starting a business by providing an art space and all the necessary equipment. I began my printing escapades with Helen of www.nellystreasures.com who took me through putting a design onto a tea towel. Helen also had a clothing rail and other pretty special knitted items for sale as well as being a dab hand at screen printing. Next to Helen is the kids table where the little ‘uns can get in on the action, I don’t know what they were doing but it definitely sounded like fun. Furnished with my special new tea towel, I headed over to the Print Haus guys to pick out a design for my t-shirt and tote bag. The guys will guide you through everything, even the oddly satisfying act of seeing your newly printed t-shirt drop all nice and warm out of the end of the tunnel dryer, it’s slightly akin to freshly baked bread. T-shirts are just £10 including printing and the tote bags are £5. And there were other activities I didn’t even get round to, not to mention the many stalls and craft tables set up. 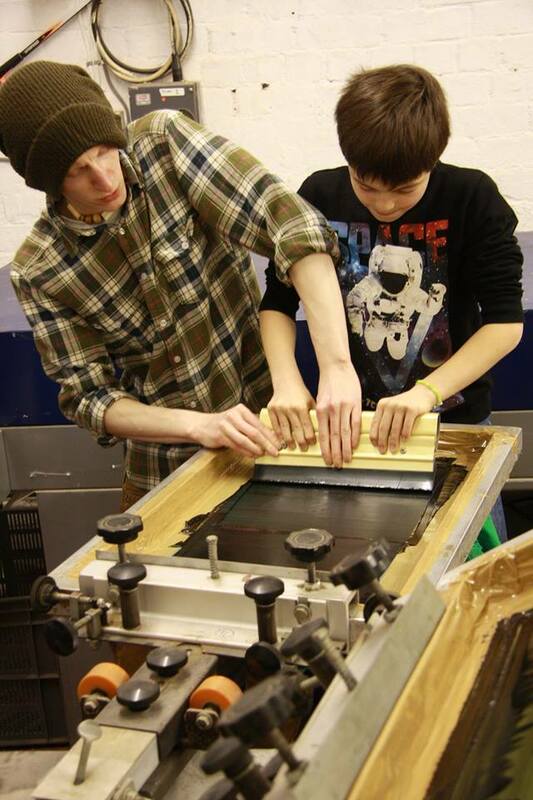 It is a creative and friendly environment with a real sense of community with an admirable ethos; provide an accessible and open environment in which anyone can learn everything about printing and create one off designs. 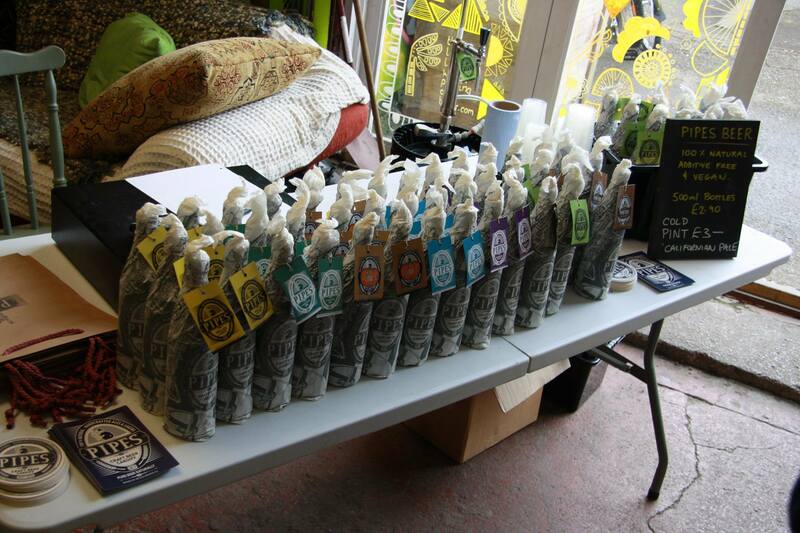 And not only that, the opportunity is offered to become a member and then display your wares at the Snapped-Up Market. The project is a breath of fresh air from the big brand, high street take over and is one which definitely deserves to be supported. Run by locals, for locals, supporting locals and good fun for kids and adults. 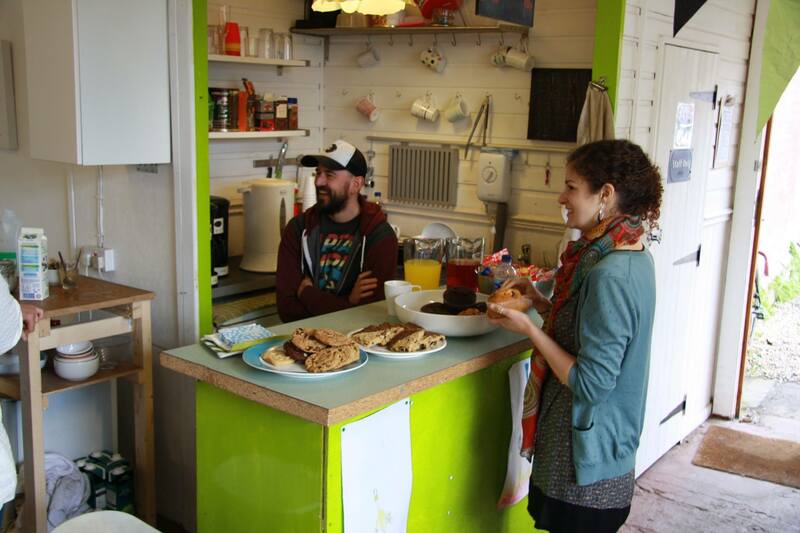 It’s a sweet initiative and something which Cardiff could really do with more of. 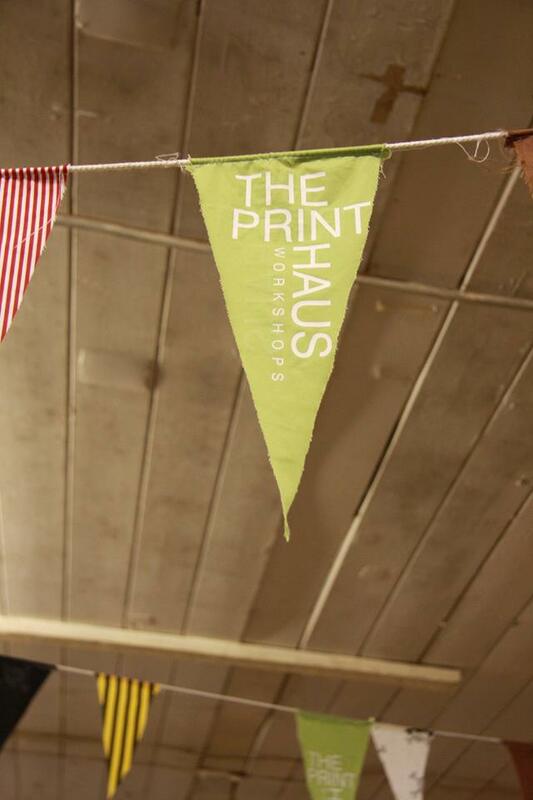 The next market is on 6 July – keep an eye on the Printhaus Facebook page for updates – and the theme is Wrestling. I’ll see you there. Snapped Up Market Facebook page – next event 6 July for a wrestling-themed day!